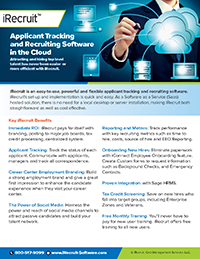 Planning to upgrade to your recruiting, hiring and onboarding process in the new year? This entry was posted in Blog, iRecruit Blog and tagged applicant tracking software, ats, demo, iRecruit, recruiting software, webinar. Bookmark the permalink.